Our company is a leading manufacturer and supplier of Induction Base Non Stick Cookwares. Our product range includes products like Induction Pressure Cookers, Induction Frying Pans, Induction Kadai and many more. These products are induction based and have wide applicability. Therefore, these induction cookwares are high in demand. Also, these cookwares are available in different sizes at excellent rates. Our company is a well-known and established company in the field of manufacturing, supplying and exporting top quality Induction Base Frying Pans. 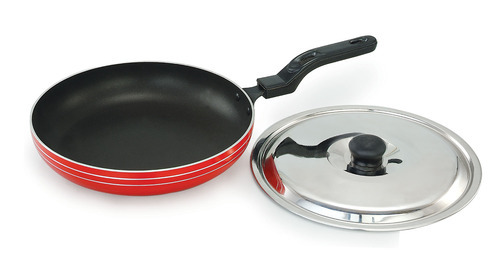 These frying pans are very easy to use and are much reliable and durable. These are widely demanded by our customers due to their wide application and durability. Our products are made from top quality and verified steel and are tested by our experts. These attractive induction frying pans are available easily in the market at affordable price. Using the best quality material, we are engaged in offering a wide range of Induction Base Pans to our esteemed clients spread all over the globe. We are a client-centric company and mainly focus on the requirements of our clients by paying utmost attention to their satisfaction. We are among the most reputed and leading companies involved in the manufacture, supply and export of Induction Base Saucepans. These saucepans are made with top quality material and are durable. These are available in different capacity size and designs. These are acclaimed widely and demanded by our customers due to their nice appearance, sleek designs and durability. We offer these induction saucepans at much pocket friendly prices for our lovely customers. We are a renowned company dealing in the manufacture, supply and export of Induction Base Kadai in the market. Our products are reliable and are very much demanded because of their good features. These kadai are available in different size, styles and designs as per our customer’s demand. We pay attention towards the quality and appearance of our products and their quality. These products are offered for sale in the market at market leading prices. By: Pigeon Industries Pvt. Ltd.